Objective: Bone metastases occur in 30- 40% of patients with lung cancer. The aim of this study was to assess the efficacy and safety of Zoledronic acid, a third generation biphosphonates, in patients with non- small cell lung cancer and bone metastases. Methods: Among May 2004 and December 2008 fifty three consecutive patients with inoperable non- small cell lung cancer and bone metastases was evaluated. Zoledronic acid was administered at dose 4 mg every 3- 4 weeks as rapid intravenous infusion. All patients were treated with combination chemotherapy too. Results: After the treatment with Zoledronic acid was observed significant reduction of serum calcium level. Serum alkaline phosphatase also decreases but not significantly. With regard of clinical efficacy 36 of patients stabilized or reduced their needs for analgesic treatment. No grade 4 side effects were recorded. Conclusion: Zoledronic acid as rapid intravenous infusion is safe and convenient in the treatment of patients with non- small cell lung cancer and bone metastases. Key words: Zoledronic acid, Non- small cell lung cancer, Bone metastases. Davidov DN. Our Experience with Zoledronic Acid in the Treatment of Patients with Non- Small Cell Lung Cancer and Bone Metastases. J of IMAB. 2013; 19(1):391-395. 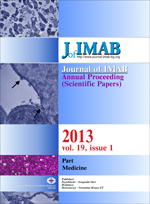 DOI: 10.5272/jimab.2013191.391. 4. Zawisza D, Pepe C, Mittmann N, Feld R, Shepherd F, Leighl N. The potential for lost productivity in lung cancer patients. J Clin Oncol. 2006; 24 (suppl):323s. Abstract 6093. 9. Rosen LS, Gordon D, Tchekmedyan S, Yanaqihara R, Hirsh W, Krzakowski M, et al. Zoledronic acid versus placebo in the treatment of skeletal metastases in patients with lung cancer and other solid tumors: A phase III, double- blind, randomized trial-the zoledronic acid lung cancer and other solid tumors study group. J Clin Oncol, 2003; 21: 3150- 3157. 10. World Health Organization: Cancer pain relief. WHO publication center, Albany, New York, 1986.